The Tim Holtz Texture Hammer is the latest tool to make it's way onto Caz's collection. The hammer comes with 4 interchangeable heads - rubber (for smoothing), metal (for flattening & attaching eyelets), dots (to create a bumpy texture), and lines (to create a canvas texture) plus a handy little mat. The hammer is quite light-weight and the tips are easy to take on and off. The fact that the head is double-sided means that you can have two different heads in use at any one time. Tim himself recommends that you wet grungeboard or paper before you distress it as it will hold the distressing more effectively. Caz found that if you painted the item you were distressing first or sprayed it with Glimmer Mist then it has the same effect as if you were wetting it. She loved the look of the combination of the dots effect tip with graphite coloured Glimmer Mist as it made chipboard letters look they they were made from beaten metal. The hammer can also be used on paper and metal embellishments. It is particularly useful for making brads look old and beat-up. If you are into the whole 'distressing' scene then this is the ideal tool for you. One of Mel's most favourite tools, the Heidi Swapp distresser is pink, cute and easy to use. You simply hold the distresser in your hand and swipe it gently along the piece of paper to achieve a nice distressed finish. They're great for the 'small scrapper' too who wants to be just like Mum, easy for them to use without cutting any fingers or small hands that might get in the way. Mel's now onto her second box of Heidi Swapp Coloured Pencils and apart from looking really cute in their long cylinder container, they write and colour in beautifully, coming in a sweet array of colours. They are pretty much shatter proof too - Mel's have been shaken up many times in their container by little fingers wanting to look and use the pencils! The Heidi Swapp sandpaper is the perfect size for distressing your papers and embellishments. 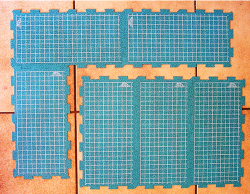 Each packet contains 5 sheets that you tear off as needed and here's a tip from Mel - cut the sheets in half to make 10 sheets or else once the outer edges wear down a little, snip them off to make a smaller (yet unscathed) sheet of sand paper. The Basic Grey rub-on tool is a wonderful new-ish little piece of equipment on the market. Nicole has owned one for some time now and at first she wasn't convinced that she needed one, her stylus was just fine thankyou. That was until she realised that the tip is spring loaded to make it a little harder than normal for you to apply too much pressure and makes applying rub-ons over a multiple layers a breeze! The flat end is perfect for smoothing out wrinkly rub-ons and picking up any stray bits. The verdict here in Nic's opinion, is that every scrap bag should have one. Once you try it you'll love it! This unassuming little craft knife is without a doubt Nicole's most essential piece of scrapping equipment. Made by Heidi Swapp the rubber grip makes handcutting even the most delicate elements easy. Changing blades is simple and the thicker stem is comfortable in the hand. Nicole has owned quite a few different craft knives but the Heidi Swapp one is by far her favourite ever! The Crop-A-Dile by We R Memory Keepers may look daunting and a bit scary but it is neither of those. With a simple squeeze you can easily and cleanly punch holes through heavy media like chipboard, leather, acetate, fabric, just about anything you scrap with! It punches two sizes and sets just about every sized eyelet you could ever use in your scrapbook. Nicole uses her Crop-A-Dile time and time again and says that she could not create mini-books as easily as she does without it. 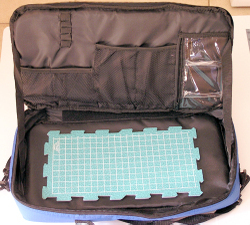 It's durable as well as it's used constantly in classes that Nic teaches. It's handy to have around the house as well Nic realised when her son's new belt was too big she effortlessly punched a new hole in the leather and set an eyelet within seconds and WITHOUT a hammer or other noisy equipment, just a squeeze of the Crop-A-Dile. It may seem a little pricey for a hole punch and eyelet setter but in Nicole's opinion once you realise just how much you use it, you'll know it's great value for money. The Basic Grey file set was a long time coming in Nicole's opinion. She can't remember not having little files for chipboard now and wonders how she ever managed without them. The small files are essential for filing and sanding places where sanding blocks and paper just cannot reach like inside chipboard letters and accents and the larger files are perfect to quickly take the edge off a photo, or for off the page projects. The flexibility of the large files makes them perfect for filing round and odd-shaped items as well. If you haven't got these, you need them! This is Steph's favourite tool and she can't scrap without it. The Basic Grey precision mat is a 15"x15" cutting mat, which is a great size to pop your layout on, plus any embellishments on the side. The 18" ruler is magnetic and fantastic for lining up photo mats and embellishments with the grid lines each side of your art work. Steph loves the magnetic tacks included in the kit that can hold bits and pieces down while you play with the design. Best of all, little fingers can't move things while they are held down by these magnets. You can also buy replacement/extra magnets if you need them. Everyone loves going along to conventions, classes, retreats and crops, and I'm sure we all hate carrying around our cutting mats - they are either too big making it awkward to carry or too small leaving not enough room for even a 12in cut. Deja Views has a fantastic product that really is a must for any scrapper who attends crops, classes, retreats and conventions; and with some conventions now placing a limit on how much you can take into the classrooms it really is a tool that all scrappers need. 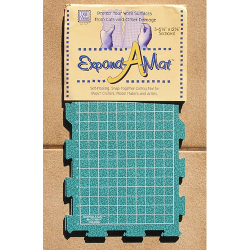 So what is it I hear you ask - Expand-A-Mat. 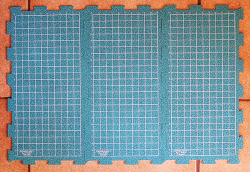 It is 3 mats of 3-61/4" x 12 1/4" which snap together to create one Matt that is big enough to work on a 12 x 12 layout. It's self healing, light weight , and easly fits into most totes. Snaps together in minutes, and is just as easy to pull apart for storage. The first question I asked was "does the blade get stuck in the groves" - answer NO !! it slides right over the top. 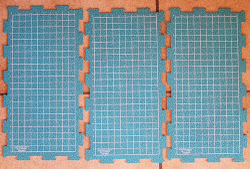 Want to make your mat a little bigger - simply purchase another pack and snap them to your old one .. and when you have finished working simply unsnap your matt and place it back into your tote bag.